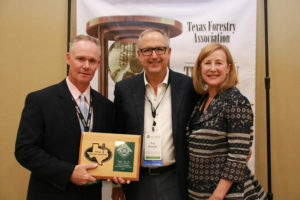 LUFKIN, TEXAS (March 1, 2018) – Texas Forestry Association will host a tour to highlight the selection of Ironwood Plantation Ranch, Ray and Diane Krueger, in Liberty County as the 2018 Texas Outstanding Tree Farm of the Year, on Saturday, April 7, 2018 from 9 a.m. to 1:30 p.m. The Kruegers’ property, located between Rye and Moss Hill, Texas, was acquired in 2008 and the rest in 2010, and became a certified Tree Farm in 2013. The tree farm is managed for multiple use for sustained yield timber and wildlife management as well as family recreation. Their management goals have gone through some adjustments since they purchased the property, however, proper stewardship, protection and improvement of unique stand and ecologically significant areas and maximizing the production of their timber asset while working towards improving the general enjoyment of their property continues to be most important to them. The tour will include observations of 2010 Longleaf and Loblolly Plantings and 2006 Pine Plantation, as well as firelanes and buffer zones. The tour will also showcase the property’s unique attributes that include river plantings which show a Pine transition to Cypress, Trinity River Sandbar which is part of a Forest of Recognized Importance, and a special site on a historical river bed. The tour will visit a Cypress Swamp, a unique ecosystem in itself. Participants are asked to wear outside attire and comfortable shoes/boots. The event is free and lunch will be provided. The guest speaker at lunch will be Tom Boggus, State Forester. Space is limited to 120 participants and registration is required to reserve your spot. Register online by clicking the Events tab on TexasForestry.org or call 1-866-TXTREES, 936-632-8733 or email tfa@texasforestry.org. with your name, mailing address and the number attending. 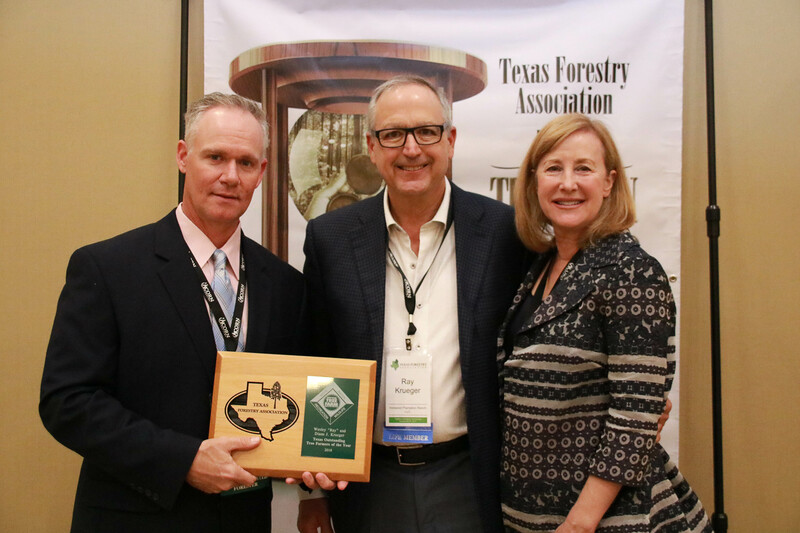 Jason Ellis, left, presents Ray and Diane Kruger with the award for 2018 Outstanding Tree Farmers Of The Year during the Texas Forestry Association’s annual banquet held Oct. 25-27, 2018 at The Fredonia Hotel in Nacogdoches, Texas.